Australian women can’t be too fussed about the long-term consequences of dying their hair or our hair colouring industry would be less bouncy  the retail market for salon and DIY dyes is a staggering $1.056 billion according to industry market researcher, IBIS World. Whether you dye your mop for fashion or to cover crinkle-cut greys, at some point you have to question whether all those chemicals are good for you. We know that skin is porous and that what it absorbs swims directly into the bloodstream (eg: Nicotine patches). I can’t imagine that our bodies have evolved fast enough to safely process the flood of chemicals that now bombard it through polluted air, `sanitised’ water and overprocessed foods. According to research into hair dye and various cancers (breast, Annals of Epidemiology 1992; leukemia and brain, American Journal of Epidemiology, January 2004, November 2006 ; bladder, University of Southern California 2001), hair dyes are high on the “potential risk factor” for causing cancer, and studies recommend further investigation, particularly of darker permanent hair dyes. In 2006, the European Union (EU) added 22 chemicals to a list of 50 hair dye chemicals now banned overseas after being linked to the University of Southern California study that identified high risk groups susceptible to bladder cancer. Dyes used for 15 years or more tripled a person’s risk factor, and darker dyes, because they use more chemicals, further increased the risk. Among the primary nasties are peroxide, resorcinol, ammonia and paraphenylene-diamine (PPD). Even if you down-grade to semi-permanent colours, they’re still likely to contain one or more of these chemicals in small amounts in order to activate the colour. Safe alternatives are around, such as henna and vegetable-based rinses, but they’re short-term and don’t hide a full grey mop well. Ultimately the safest colour is your own, but when, if ever, will a prosperous beautification industry celebrate your innate features as good enough? In Australia, the assessment of hair dye chemicals and the labelling of dye products provide safety-on-paper. Sure, they’re tested on animals (cringe) for weeks, sometimes months, but not years. Take the colour, Basic Orange 31. In 2006, Australia’s National Industrial Chemicals Notification and Assessment Scheme (NICNACS), which assesses the public and occupational health and safety risks of such chemicals, did a report on Basic Orange 31. Animals were “sacrificed” due to severe ocular irritation” and guinea pigs injected with the stuff apparently experienced “a normal development of the local symptoms” which included severe inflammation, swelling and rotting skin. Basic Orange 31 also caused orange colouration in the urine and faeces of animals tested, so we know it penetrates physiology well beyond hair follicles. And while the report found there was “no significant public health concern” regarding its use in small doses, Basic Orange 31 still needed to be classified as a “hazardous substance”. The NICNACS recommended labelling was pretty standard for permanent hair dye: “may cause sensitisation by skin contact” [which means regular use may create abnormal sensitivity to a range of chemicals]; “risk of serious damage to the eyes”; “avoid contact with skin and eyes”. I’d like to know how you avoid skin contact when applying hair dye. I asked my friend Adrian (name changed), a hair colourist for 24 years, about his experience with hair dye. His homeopath ran tests that found he had the same level of heavy metals in his system as a chemotherapy patient. For a check list of offending chemicals, go to the European Union website for the latest updates. I started greying (and dyeing monthly) in my early 20s. By mid 30s, I’d buy the “ammonia free” hair dyes and nestle into the safety of denial over the lung-locking fumes, constant itching and chronic dandruff that long-term use of colour 5N seemed to cause. I got jack of it, shaved my head, went overseas and returned grey. Friends were polite, but relieved, when I hit the bottle again. Last year, during a long bout of brain fog, I contemplated the myriad possible reasons behind my flagging cognition. Niggling insistently was: “hair dye, monthly, 20 years”. So I grew a ‘GT’ stripe for 4 months, covered it with groovy headbands then adopted a short cut with silver highlights. Over the next 7 months, I allowed myself to go grey. You don’t see too many 44-year-old women sporting their “natural colour” as my sensitive stylist,Brian, calls it. 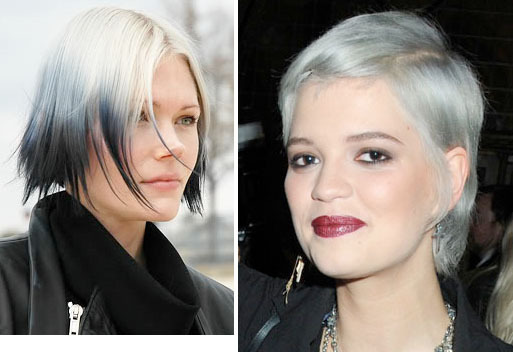 I went grey before I realised that Lady Gaga, Kelly Osbourne, Pixie Geldof and Ruby Rose were also at it. What were they after, I wondered, wisdom in a bottle? Could their generation look at mine and celebrate camaraderie-in-colour, or would they cringe at that thought? To go grey when Nature dictates, first, stock up on conviction. Second, if you’re in transition, consider light strategic streaking until the grey predominates. If you’re well advanced, take all that money you spent on dye and invest it in a six-weekly, kick-arse hair cut with a great stylist who doesn’t shrink from your progressive approach to ageing beautifully. If you’ve fallen in love with yoga or are newly exploring it, you’ve probably met at least one teacher or fellow student who radiates that something special you’d like more of. What is it about being bendy that makes you a shinier person? Your teacher tells you how asanas rejuvenate your innards in multi-fabulous ways, but how exactly does yoga create nicer, calmer, more even people that others like to be around? How does mat practice help you yoga through the ups and downs of life? Off, On, Off, On, On, On: For too many of us, the autonomic nervous system’s “fight or flight” stress response is jammed to “On”. Each class retrains your body to move quickly between the “On” response during heart-pumping asanas and the parasympathetic nervous system’s “Off” response when you’re instructed to take a micro-rest. Outside class, how quickly can you recalibrate after an argument? Can you employ the same focussed will to quiet a racing mind or heart? Be the duck – let the small stuff trickle off your back and you’ll swim more smoothly through life. Surprise! You’re in charge: If you take just one breathing technique from class and use it to alter your state of being when you’re anxious, snappy, exhausted, you’re doing the world a big favour. It breaks that reactive cycle of lashing out when you’re not centred and, just as it does in class, it glues the fragmented pieces of you together again. Adventure inward: Yoga is a multi dimensional practice and an adventurous journey. Your first destination is focus. You can spend years foraging here, working out when a stretch is heading for a strain, learning which postures ignite, or wipe, your energy. You practise catching your mind’s participation (and impact) during class as it meanders from critical thought to useful observation. Focus introduces you to feelings that bubble up on the mat, like restlessness, superiority, boredom, irritation and defeat, and asks you “Why?”. Outside class, that multi-level directory of awareness begins filtering into your day until you become the expert observer of your own foibles. You’ll notice how many times you barely breathe, you’ll catch your shoulders hanging out with your ears, and any damaging thoughts before they become words or actions. You’ll learn to feel your feelings and deal with them, instead of stuffing them into your cellular structure where they backlog energy, swell and flare into dis-ease. Roll the mat, nicely: Being asked to fold your blankets a certain way and to stack them neatly shows respect for the next student and respect for the property. Why forget those small acts of service outside class? The shiny person doesn’t mind changing the office toilet roll and hasn’t forgotten the Nod of Gratitude to the driver who lets them though. They put their own dirty clothes in the laundry basket and wash their own coffee cup at work, and maybe someone else’s. I surrender! : In class we learn to “give in” and “let go” in between postures to allow the body time to assimilate the benefits such as nourishment received (richly oxygenated blood), improved energy flow and toxin/tension release. When we surrender in relaxation, the reward is an exquisite sense of wellbeing and connection with something bigger. Much bigger. Life, it’s all practice: At a recent Yoga in Daily Life teacher’s workshop Gita gently reminded us: “It is just practice after all.” As on the mat, so in life. Yogis live by the credo that every moment of every day is an opportunity to grow. We’re practicing to be better people. When things go awry in life, practise new responses until you find what works. If you’ve learned to arrive at the mat with an open heart, and to practice without judgement and to accept where you’re at physically, emotionally and mentally during that hour, just roll that attitude up and take it with you. That way, you’ll keep practising.